Emily and Melissa Elsen’s Four & Twenty Blackbirds Pie Book (Grand Central Life & Style, 2013) is organized by season, the theory being that the best pies are made from seasonal ingredients (or, I suppose, those ingredients that keep well when you don’t have anything in season). By all the usual definitions, it is now spring here, but it still feels very much like winter, and I’m still working my way through the “Winter” section of the cookbook. 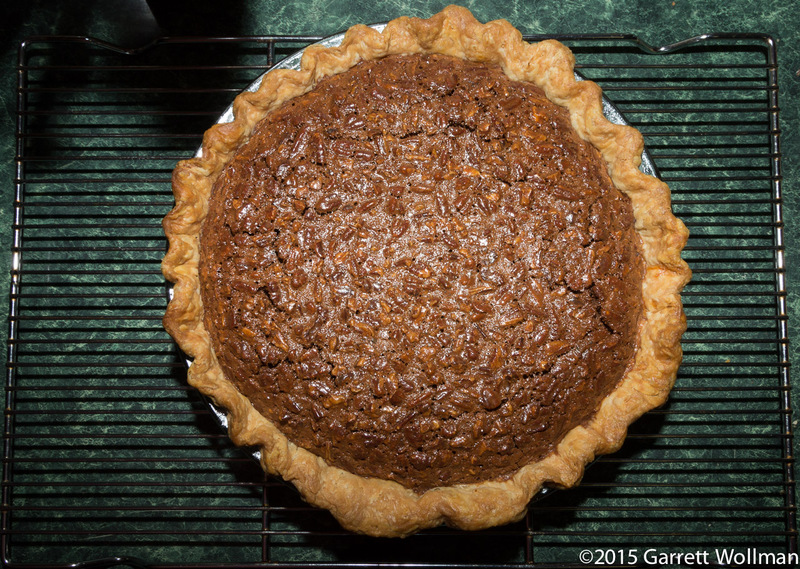 This past weekend’s effort was “Malted Chocolate Pecan Pie” (p. 188), a flavorful variation on the holiday classic. The recipe starts, as is usual, with a pastry crust, which for this recipe is partially blind-baked; I used the Elsens’ standard “All Butter Crust” recipe (I actually had a pie’s worth of extra dough sitting in the freezer for several weeks) as recommended for this dish, and you see it here cooking in the window. In a break with my usual practice, this photo is a natural-light view; I always take both available-light and flash versions of my food photos, but usually the flash version turns out much better. However, this kind of pastry is translucent to start with, and baked in a Pyrex dish, which makes it difficult to see the texture of the crust when photographed with a flash; without the flash, you can see how the pastry has been docked (had holes poked in it) as part of the preparation. And this is the rest of the mise en place for the pie filling — with one exception: I’ve left out the brown sugar, a cup of which is the primary sweetener in this pie. The chocolate (only two ounces) and malted barley syrup (a quarter cup) provide additional sweetness as well as deep, bitter flavors. The dairy part of the custard is provided by the butter and by half a cup of sour cream — no liquid milk or cream is used — and the custard is thickened with eggs from a local farm (ok, actually from my boss’s laying hens). Additional spices are cinnamon (I used true cinnamon, not cassia) and ginger, with a fair amount of salt to balance out the other flavors. 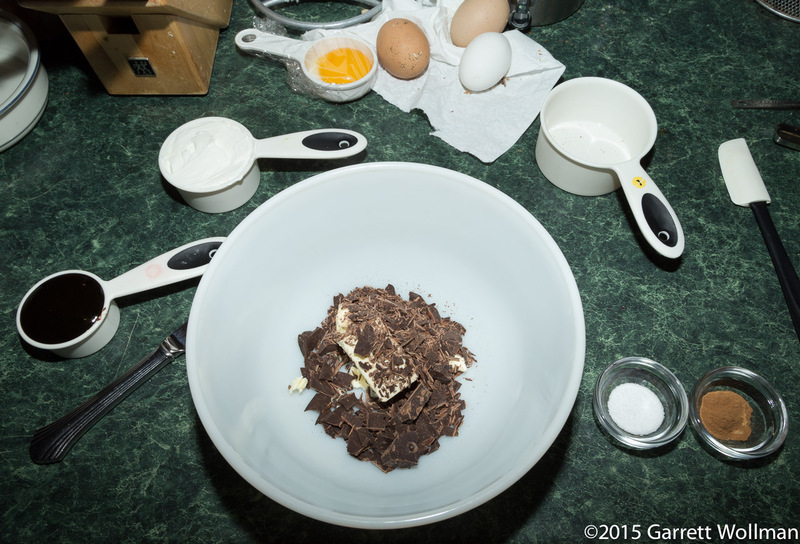 The chocolate and butter are melted together in a double boiler — although I see no reason you couldn’t just use the microwave — and then the sweeteners and spices are mixed in. 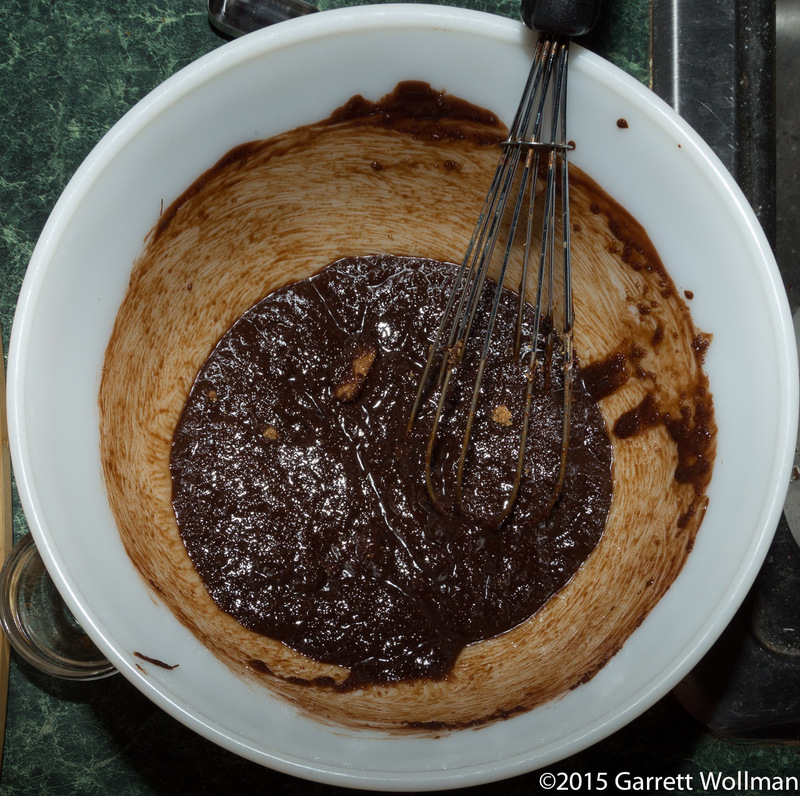 (You can still see some clumps of brown sugar that aren’t dissolved yet!) 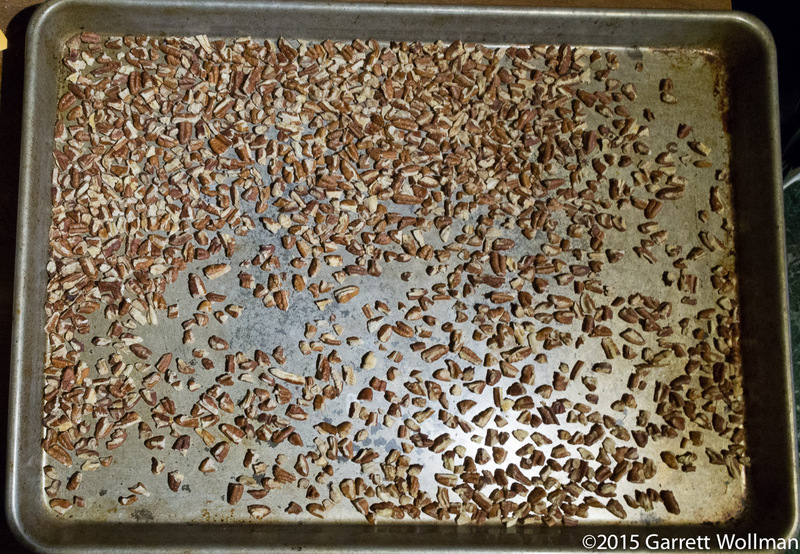 Then come the remaining ingredients: sour cream, then egg, then the toasted and cooled pecans. The custard is immediately poured into the prepared pie shell — sitting on top of a half-sheet pan to catch any drips — and baked for about 55 minutes in a 350°F (175°C) oven. Somewhat to my surprise, the pie was completely done at the low end of the time range specified in the recipe — I’ve had trouble with similar pies needing much more cooking — perhaps because the oven was heated to toast the pecans and then stayed on for half an hour or more while I prepared the rest of the filling. 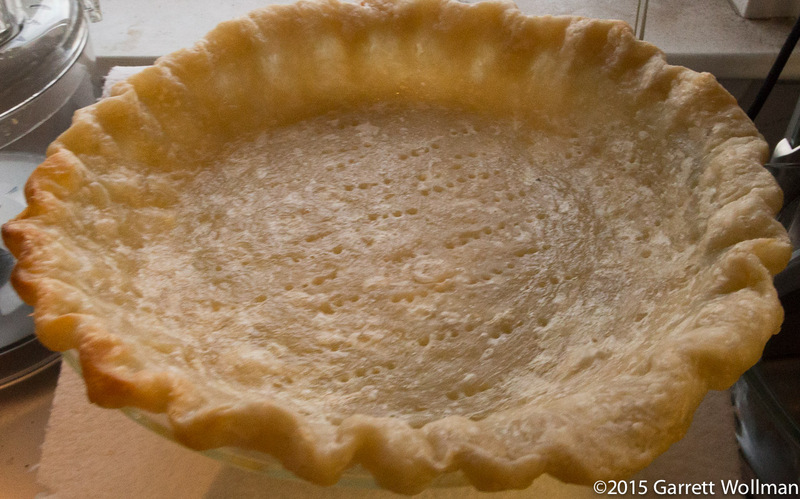 The pie comes out of the oven slightly domed in a ring around the edge, but with the filling fairly solid on top. As it cools, the dome subsides and the top is completely flat. So there’s the rest of the pie. All 10 slices were gone in short order (although I did eat one myself, and I cut the last one into smaller pieces). 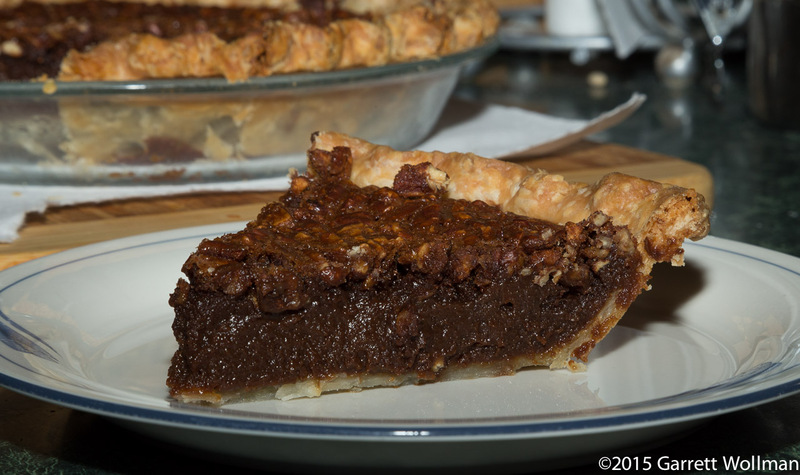 Overall impression: neither I nor several of my other tasters could identify any specific chocolate flavor in this pie, but it does enhance both the color of the custard and the bitter undertone of the sweeteners. Everyone who tried a slice professed enjoyment, although it’s not always easy to tell whether they really liked it or were just worried about having their network access cut off. (Just kidding. I think.) Around the lunch table, we discussed a bit whether the same formula would work with maple syrup instead of the malt; I suspect that it would, but I generally find maple flavor objectionable with anything other than pancakes. I expect to do one more “winter” pie before moving back to the “spring” section, but those spring pies will probably have to wait a while as all of New England recovers from this cold and snowy winter! 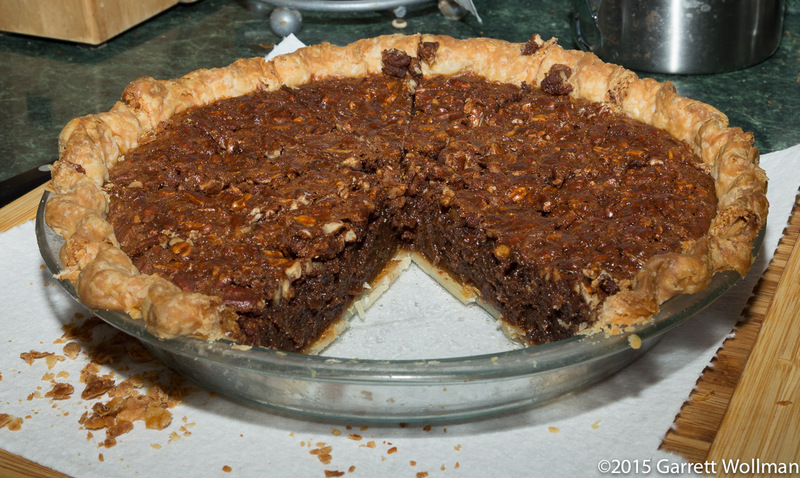 Nobody expects a pecan pie to be especially nutritious, but this one is, on the scale of things, not horrible — particularly if you follow my advice and slice it into twelve, rather than eight, servings. As I noted above, that keeps the calorie toll just under 400, which puts it in the realm of reasonableness for me (in conjunction with a light meal, not a heavy holiday repast). 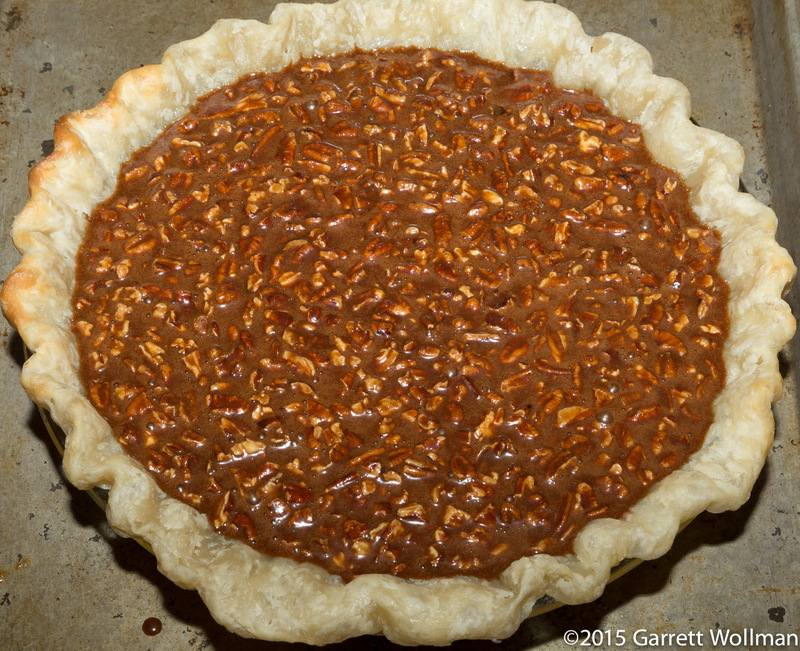 Gallery | This entry was posted in Food and tagged Four & Twenty Blackbirds, pecan pie, pie, recipe. Bookmark the permalink.